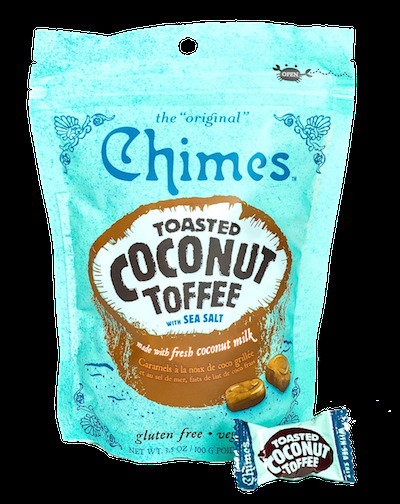 Recently I bought a bag of Chimes Toasted Coconut Toffee candies after hearing about them. Vegan toffee is not something you come by often - toffee after all really is a butter infused sweet. They are individually wrapped hard candies that are sweet with a hint of sea salt goodness. Upon opening the bag and sharing with the boyfriend we both agreed they are super good! They are nutty and toasted tasting and the hint of sea salt adds a nice kick. Made with real ingredients and not artificial flavorings these are really a tasty treat that is full of flavor. Everyone I have shared them with enjoys them but the biggest fan so far has been Mady! I popped one into my mouth and as soon as she smelled it, ran up and started pawing my mouth! I had to hold one out for her to lick. She has done this to Matt too! Mady really likes her sweets - silly kitty!